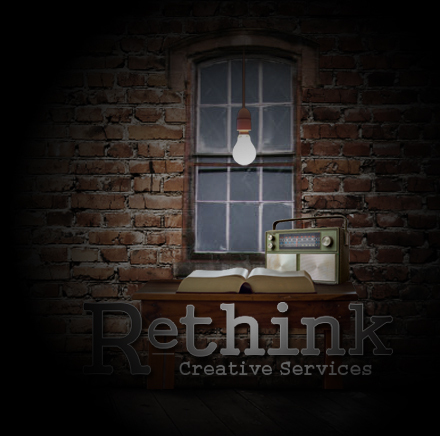 Every organization was born out of someone’s passion, and Rethink Creative Services is no different. Started in 2009, Rethink brought together people with vastly different personalities, skills and life experiences … but who had a common passion for creativity. Rethink “gets” what it’s like to be a small business — that’s what we are, too! We are here to produce and equip you with quality marketing products, so that you can share YOUR passion more effectively with others … and you don’t break the bank doing so. We believe you matter, regardless of the size of your business, your budget or your resources. Integrity and the value of humanity are important to us, and we’ve built this company on the foundation of our personal beliefs. Therefore, we won’t take on any projects that compromise our morals and ethics. If you care about people and excellence, then we’re here for you!